Magnifying lamp and stand (black) - Delivered Australia wide. 12.5 cm round Glass lens. Magnification is 5 dioptre (2.2 times). Heavy 5 legged pedestal base. Popular Mag Lamp with Beauty Salons. 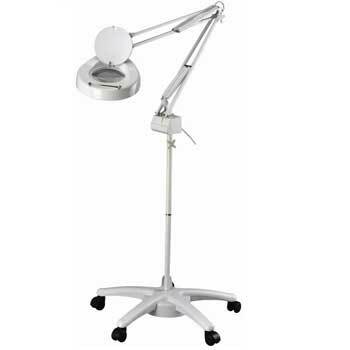 Magnifier Lamps are able to be delivered Australia wide. Online payments accepted using MasterCard, Visa or PayPal. internet banking or cheque also available. Need help deciding then call on (02) 6162 1950 or email us. Desk top, Clamp or Floor Stand units available. All models are available for review at our Canberra store.